In mid-March, Sergio Mannheimer, Pedro Perez and Tomaz Lyra announced the launch of Mannheimer, Perez e Lyra Advogados. 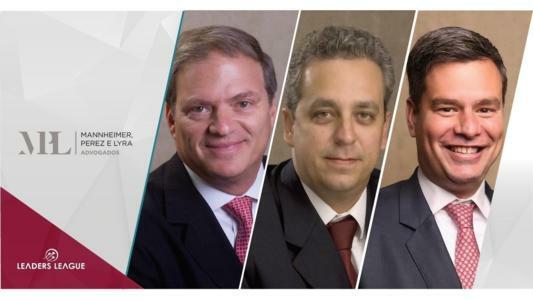 In mid-March, through the restructuring of a renowned Rio-based law firm, seasoned practitioners Sergio Mannheimer, Pedro Henrique Perez and Tomaz Lyra established Mannheimer, Perez e Lyra Advogados, a new dispute resolution boutique which brings together nine experienced partners and 15 associates. Sergio Nelson Mannheimer holds a Bachelor of Laws from Universidade do Estado do Rio de Janeiro (UERJ) and an LL.M. from Heidelberg University Faculty of Law. Besides spending over 25 years as a litigator at Andrade & Fichtner, for over three decades Mr. Mannheimer also served as a Public Attorney for the State of Rio de Janeiro. He has lectured at such renowned institutions as Universidade Federal do Rio de Janeiro (UFRJ), is co-author of works such as ‘New Themes in Arbitration’ (FGV - 2014), ‘General Theory of Arbitration’ (GEN – 2018) and since 2014, has held the position of director at the Brazil-Germany Chamber of Commerce and Industry. With over 20 years of experience under his belt, name partner Pedro Henrique Perez began his legal career at Prisco Paraíso Advogados, where he remained for approximately eight years. In 2005, Mr. Perez joined Andrade & Fichtner Advogados as a partner. After almost fifteen years at the firm, he became name partner at Mannheimer, Perez e Lyra Advogados. On the academic side, it is worth noting Mr. Perez earned his Bachelor of Laws from UERJ. After obtaining a Bachelor of Laws from Pontifícia Universidade Católica do Rio de Janeiro in 2003 (PUC-Rio), Tomaz Tavares de Lyra became an associate at the now defunct Lobo & Ibeas Advogados, where he started as an intern in 2000. In 2008, Mr. Tavares de Lyra joined Andrade & Fichtner Advogados, where he was promoted to partner in late 2011. After approximately 11 years at the firm, litigation and insurance expert Mr. Tavares de Lyra became a name partner at Mannheimer, Perez e Lyra Advogados. With offices in Rio de Janeiro and São Paulo, Mannheimer, Perez e Lyra Advogados focuses on both the prevention and resolution of judicial and arbitral disputes before national and international institutions. In addition to the abovementioned name partners, other partners at the firm include: Julio Rebello Horta, Karina Stern de Siqueira, Marcela Levy, Marcelo Dickstein, Fernanda Aviz and Ricardo Ramalho Almeida.